“… Muslim Americans like to say, (America has) the most diverse group of Muslims anywhere except in Mecca during the annual pilgrimage or hajj. ... Infact, Muslim Americans represent the most affluent, integrated, politically engaged Muslim community in the Western world” – Newsweek / special report, Islam in America. July 30, 2007 issue. In terms of diverse groups of Muslims, America is only second to Mecca during the annual pilgrimage or Hajj, when virtually Muslims from every corner of the globe gather in. One can find people of all race, color and nations there united as one humanity. After Mecca it is America which has the most diverse group of Muslims, people of faith who believe in One God, who believe in Prophet Muhammad as the last Divine messenger and also who believe in all the Biblical Prophets including Jesus Christ (and his second coming). 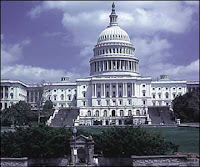 :: The U.S. Congress passed the Ramadan resolution unanimously 376-0 on October 2,2007. This is HISTORIC for American- Muslims and Muslims around the world. This is the first time in history that the United States Congress will commemorate and recognize the month of Ramadan as the Islamic holy month.